This is a special limited US edition of Tamir's debut CD, originally released in Japan in July 2008. 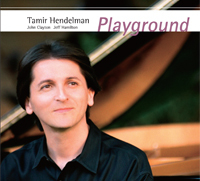 Joined by the ace rhythm section of bassist John Clayton and drummer Jeff Hamilton, Tamir explores music by Jerome Kern, Harold Arlen and Herbie Hancock and presents a handful of colorful originals. © 2010 Tamir Hendelman. All Rights Reserved.